Caihua powder - take 1/2 teaspoon with water 3 x day on empty stomach. BOTANICAL NAME: Cyclanthera pedata (L) Schrad. COMMON NAME: Caigua or Caihua. 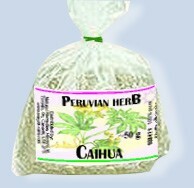 Caihua is derived from Perú and belongs to the Cucurbitaceas family, whose fruit is edible. (Cyclanthera pedata) L. Schrad. : Curcubitaceae. ”Caigua”, "Wild cucumber". Cultivated. Fruit edible. It has various medicinal usages. The tea of the seeds is well known for controlling high blood pressure. De Feo suggests that the decoction of the epicarps is also anti-diabetic. 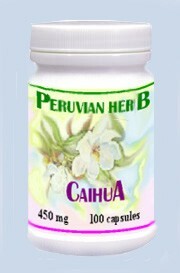 Caihua has been used by Peruvians for generations, for its cholesterol reducing and fat absorbing properties. It has been said that Caihua is the most natural and the most potent fat absorbent available, therefore it is highly recommended as significant contributor in any weight loss program, it also stimulates well metabolism. The Caihua reduces blood cholesterol levels, specially light cholesterol (LDL) that is accumulated in arteries as lipoprotein components which are determinative agents on arteriosclerosis processes; it prevents the cardiac and coronary diseases. PRESENTATION:- Caihua powder, extract capsules. USES: It is usually eaten as vegetable in salads, in case of disease or/and obesity it can be eaten as juice extract in fast. Excellent book - The Green Pharmacy Anti-Aaging Prescriptions -The number of herbs mentioned in this book may be overwhelming and it also contains chapters devoted to the more general topics of pain relief, weight loss, and insomnia.